Brothers, I greet you in the name of the Supreme Basileus of the universe. It is with a great sense of humility and sincere honor that I accept my last year as your State Representative for FY 18-19. It is a great honor to lead you. We have accomplished a great much during the last 2 plus years by the grace of GOD. I fully anticipate and expect the last year to be the best year yet. The focus this year is three-fold. First, while we have engaged our voter registration module by partnering with others to register over 6,000 voters last year. We must now turn our efforts to mobilizing our voters. Every Brother is asked to ensure at least four voters get to the polls directly from his efforts to assist in the facilitating of systematic change. We must partner with others (churches, and other social/civic organizations) to get our voters to the polls. We are on the cusp of the 2020 Presidential elections. Omega Men must exercise leadership in order to change our political landscape and empower others. Omega Men have always led the charge for social justice and voter empowerment since November 17, 1911. 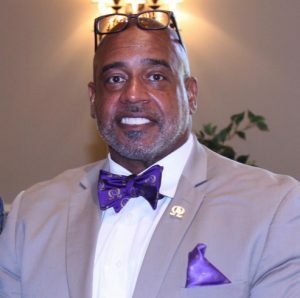 Secondly, every Brother is asked to reclaim four Brothers in the name of our Founders’ and as part of the overall program our 41st Grand Basileus Brother Dr. David Marion has revealed for reclamation. As last year, the State will implement new innovative programs to reach our reclaimable Brothers. We are powerful beyond measure, and together we can obtain unparalleled heights through reclamation. Finally, become a mentor to a younger Brother and find a young man in your community to mentor. Our youth in our communities across the State are seeking positive minded Men to mentor them. It is our responsibility and obligation to assist the next generation to adulthood. Leadership and mentoring are action words. 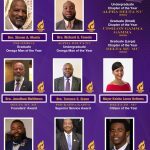 Throughout the history of Omega in Georgia, those that came before us; Brother Robert Church, Brother Arthur Owens and Brother William “Bill” Bryant only asked one thing of those who followed….Lead through your commitment and service to our communities through Omega. We have a responsibility to all who have walked before us to continue the great successes of the past. Our communities look to Omega Men to lead through these difficult times….and LEAD WE MUST! 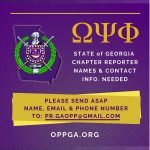 Know that your GA State Council is here to serve you. We stand at the ready line to assist with any and every challenging issue. 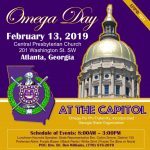 May GOD continue to bless you and your families, and bless the Omega Psi Phi Fraternity, nearest our heart! Thank you, again for allowing me the opportunity to serve in this capacity.